I was blessed to receive some stamp sets from Ann at Stamp Anniething – she’s got some adorable people stamps if you like coloring people! 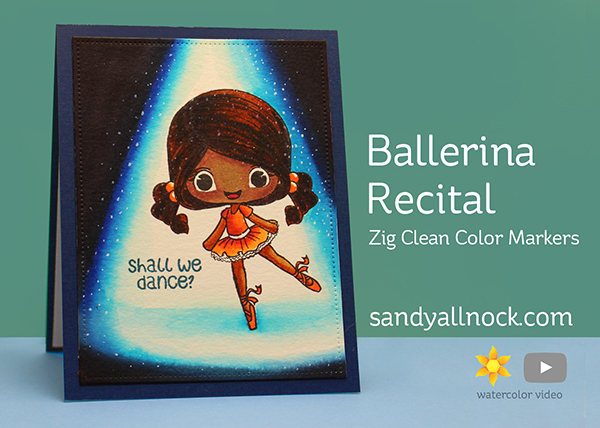 I chose to color Paige the ballerina in my Zig markers – and give her a stage to dance on! Watch the video below or click HERE to see it in HD on YouTube. So many people wanted to enter the giveaway HERE that my site crashed for a few hours the other day – eeep! It’s safe to go visit now. One at a time, please. LOL. I’ll be posting a winner on Sunday am! I feel like I just watched a wonderful play, your colouring is so interesting to watch. TFS! Great job on the card…thanks so much for the ‘how to’ video! Beautiful! I love the spotlight you created for her. Those pens look fun! Sandy the entire card came out fabulous. I enjoy watching your videos. Great video. I may try a stage today. Thanks. Love how you did the spotlight! Thanks for passing along information about this stamp company!